A tropical disturbance has increased in organization and we believe that tropical depression 8-e has formed . 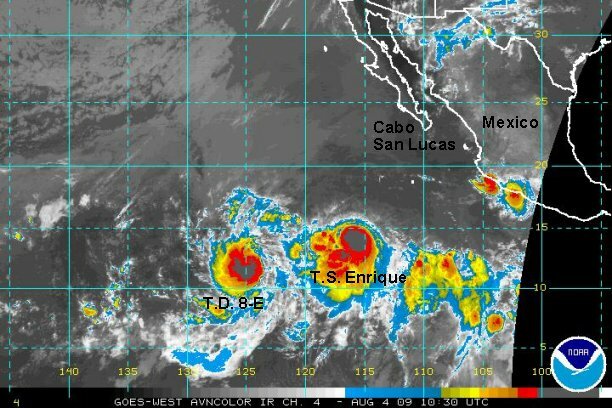 As of 9:30 pm edt / 6:30 pm pdt it was centered near 11.9° N / 122.8° W or about 1125 miles southwest of Cabo San Lucas, Mexico. NHC will probably classify this system soon. We estimate top sustained winds at 30 mph. This tropical cyclone is moving west northwest at about 15 mph. Conditions are favorable for futher strengthening as it moves out to sea away from Mexico. ***NHC just classified as 8_E for the 8 pm pdt advisory. 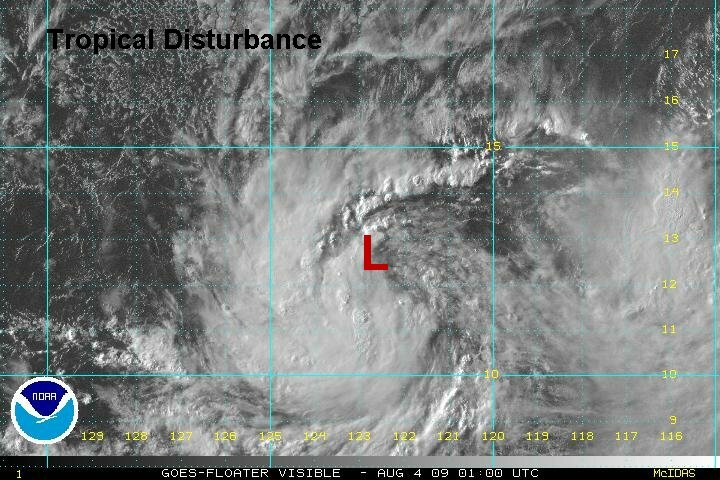 Tropical depression 8-e has shown increased organization with a deep convection burst over the last few hours. It is not a threat to Mexico. As of 6:30 am edt / 3:30 am pdt it was centered near 12.8° N / 125.2° W or about 1210 miles southwest of Cabo San Lucas, Mexico. We estimate top sustained winds at 45 mph. NHC upgraded to tropical storm Felicia on the last advisory to agree with our 45 mph assessment. Tropical storm Felicia continues to organize and now has an eye structure developing. With this being the case we believe that Felicia is now a hurricane. As of 3:30 pm edt / 12:30 pm pdt it was centered near 12.3° N / 126.5° W or about 1300 miles southwest of Cabo San Lucas, Mexico. We estimate top sustained winds at 75 mph. This tropical cyclone is moving just south of west at about 13 mph. 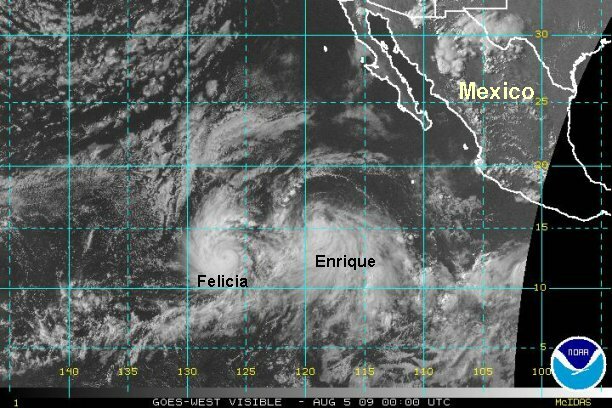 Felicia has shifted it direction, possibly in response of the circulation with Enrique. Conditions are favorable for futher strengthening. NHC just updated to 80 mph. So, Felicia is a hurricane officially now. 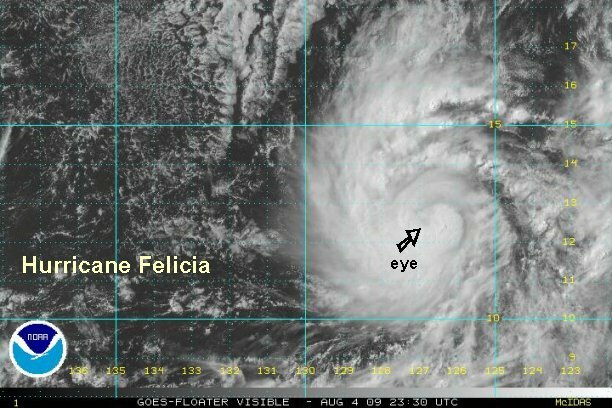 Huricane Felicia has had an eye for several hours now. 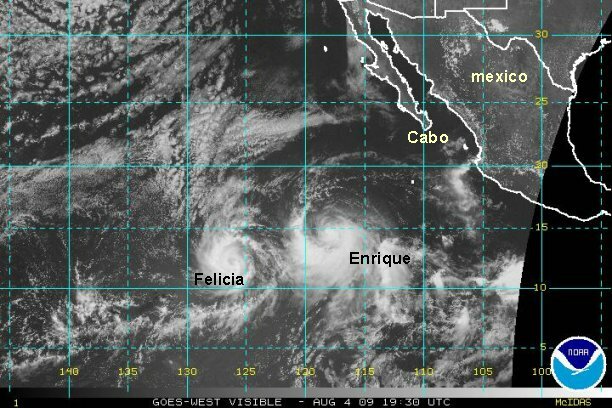 As of 8:30 pm edt / 5:30 pm pdt Felicia was centered near 12.7° N / 126.8° W or about 1300 miles southwest of Cabo San Lucas, Mexico. We estimate top sustained winds at 85 mph. This tropical cyclone is moving northwest at about 12 mph. Felicia has slightly shifted direction again. Conditions are favorable for further strengthening. As of 5:00 am edt / 2:00 am pdt Felicia was centered near 13.4° N / 128.2° W or about 1365 miles west southwest of Cabo San Lucas, Mexico. Officially NHC has top sustained winds at 105 mph. 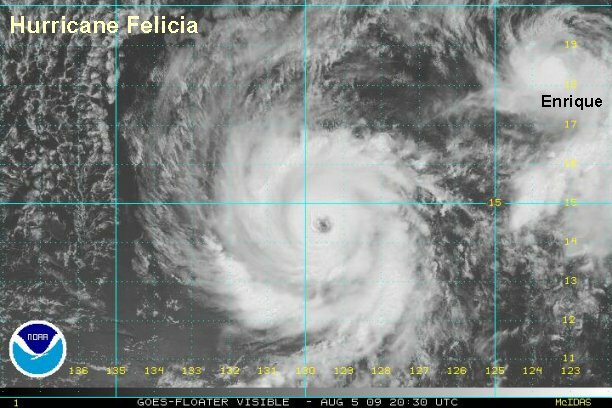 We estimate top sustained winds at 115 mph, making Felicia a major hurricane in our opinion. Hurricane Felicia is moving west northwest at about 12 mph. Conditions are favorable for further strengthening. Satellite imagery shows the western eyewall starting to cool. This will continue the strengthening phase, as this is the only ragged part of the hurricane. Very deep convection is noted on the eastern side of the circulation. NHC upped their winds to 115 mph to match our previous estimate. Satellite imagery continues to show increased organization. 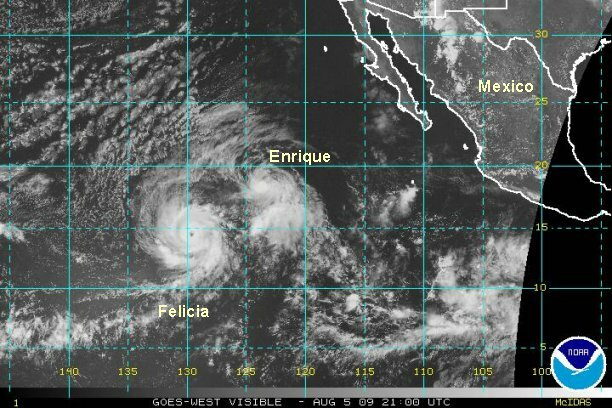 As of 5:30 pm edt / 2:30 pm pdt Felicia was centered near 14.5° N / 129.7° W or about 1420 miles west southwest of Cabo San Lucas, Mexico. 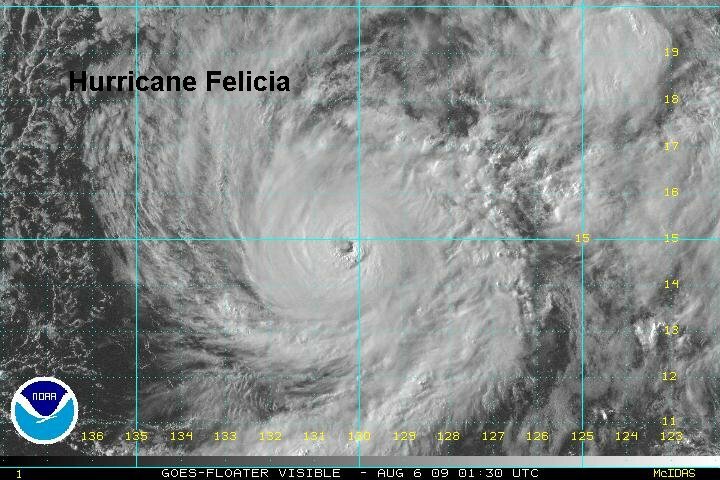 Felicia is now a classic looking hurricane. The eyewall has solidified and almost complete. The only small weakness was noticed on the southeast side of the eyewall. It's possible that Felicia make a category 4 hurricane. Cat 4 is 131-155 mph. As of 11:00 pm edt / 8:00 pm pdt Felicia was centered near 14.9° N / 130.5° W or about 1455 miles west southwest of Cabo San Lucas, Mexico. Officially NHC has top sustained winds at 140 mph. We agree with that estimate. Hurricane Felicia is moving west northwest at about 12 mph. Strengthening may increase a little more then start to level off. 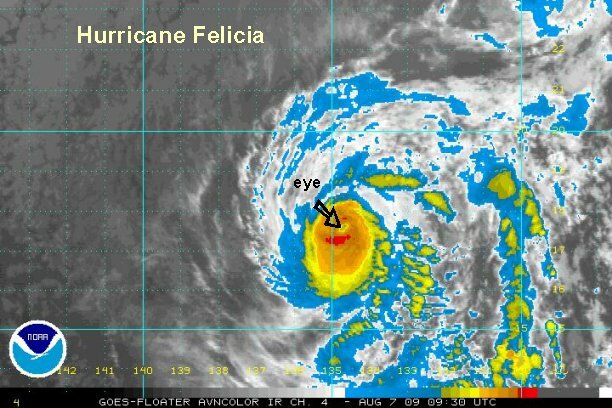 Low clouds are now seen in the eye of Felicia. It's still a long way from the Big Island of Hawaii. It's possible it could reach the Big Island as a tropical storm or tropical depression. Weakening is expected before then. As of 7:00 am edt / 4:00 am pdt Felicia was centered near 15.7° N / 132.3° W or about 1470 miles west southwest of Cabo San Lucas, Mexico. Officially NHC has top sustained winds at 140 mph still . We are going to go lower. I.R. satellite imagery shows that the cloud tops have warmed in the eyewall overnight. Also, the eyewall width has decreased some. We are going to estimate 130 mph. ( This would make Felicia a strong cat 3 in our opinion again.) NHC is forecasting Felicia to remain major though early Thursday night - cat 3 or higher. 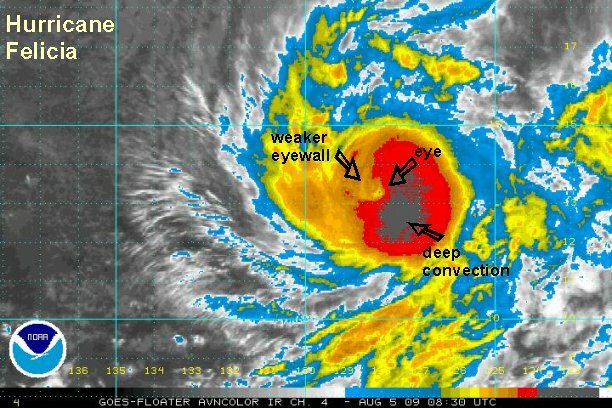 This weakening trend may occur earlier if the eyewall deterioration continues. 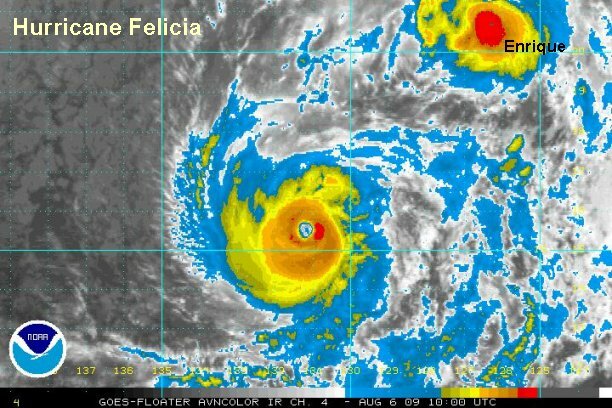 Hurricane Felicia is moving west northwest at about 11 mph. 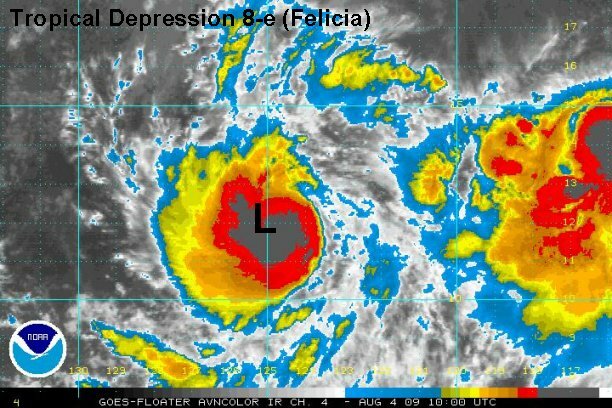 It's possible Felicia could reach the Big Island as a tropical depression early next week. 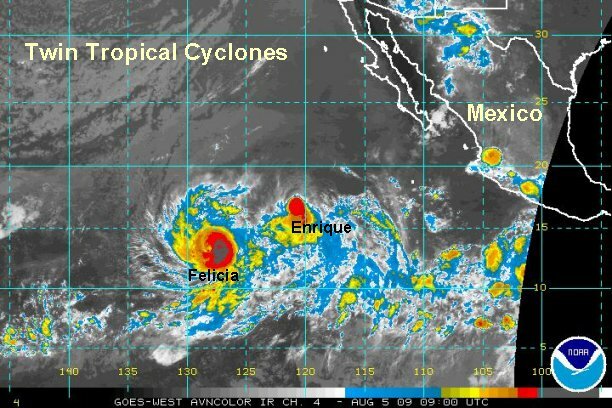 As of 3:00 pm edt / 12:00 pm pdt Felicia was centered near 16.4° N / 132.6° W or about 1535 miles west southwest of Cabo San Lucas, Mexico / 1485 miles east south east of the Big Island of Hawaii. We estimate that Hurricane Felicia is now down to 120 mph. 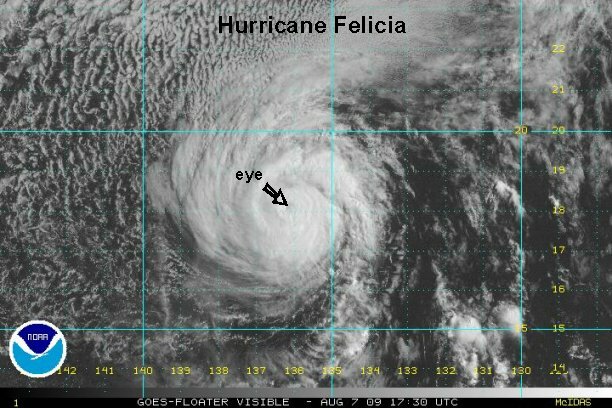 Hurricane Felicia is moving west northwest at about 10 mph. Satellite imagery continues to show a methodical reduction of the eyewall size on Felicia as well as some cloud top warming. We expect that NHC will lower their wind speed estimate from their 140 mph on their previous advisory. As of 9:00 pm edt / 6:00 pm pdt Felicia was centered near 16.9° N / 133.4° W or about 1560 miles west southwest of Cabo San Lucas, Mexico / 1440 miles east south east of the Big Island of Hawaii. We estimate that Hurricane Felicia is now 130 mph. Satellite imagery shows that cold tops have cooled a bit again indicating some strengthening. Hurricane Felicia is moving west northwest at about 9 mph. It's possible Felicia could reach the Big Island as a weak tropical storm or tropical depression early next week. Felicia has changed dramatically overnight. Cloud top have warmed, and sea surface temps have cooled. The eyewall now looks ragged. 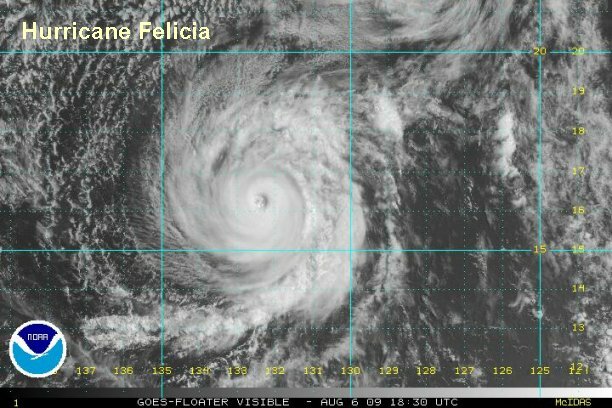 As of 7:00 am edt / 4:00 am pdt Felicia was centered near 17.7° N / 134.9° W or about 1300 miles east south east of the Big Island of Hawaii. We estimate that Hurricane Felicia is now 95 mph. The National Hurricane Center says that their estimate of 115 mph a few hours ago may be generous. A recent microwave satellite estimate was a little over 90 mph. We believe that 95 mph may be generous. Hurricane Felicia is moving west northwest at about 12 mph. It's possible Felicia could reach the Big Island as a weak tropical storm or tropical depression early next week. Sea surface temperatures are warmer just east of the Big Island which may help sustain Felicia after rapid weakening. The eye in Felicia is still barely visible, but ragged. Weakening has continued at a slower pace the last several hours. 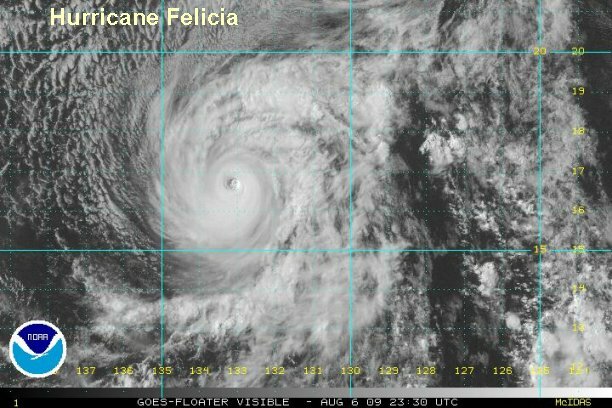 As of 2:30 pm edt / 11:30 am pdt Felicia was centered near 18.2° N / 136.4° W or about 1230 miles east south east of the Big Island of Hawaii. We estimate that Hurricane Felicia is now 80 mph. A recent microwave estimate reported about a 67 knot wind. 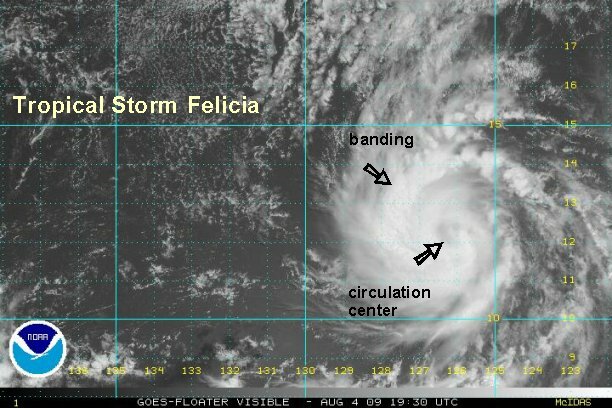 Hurricane Felicia is moving west northwest at about 13 mph.